Charity concert raises £2000 for Newbury & District Cancer Care Trust - Website of kennetaccordionorchestra! 26th June 2015 - The orchestra were approached to perform this concert in aid of the Newbury and District Cancer Care Trust. The charity is very close to the heart of our bass player Dodie, who has recently been through some intensive chemotherapy and received wonderful support from the trust throughout. The trust have offices within the Deanwood Park Golf Club in Stockcross, Nr. Newbury, who kindly offered the use of their venue and facilities free of charge to host the event. Over 100 tickets were sold and the 'full house' enjoyed the sound of renowned 'accordion king' Harry Hussey on their arrival and during the interval. At 86 years old, Harry is going strong and entertained the audience with his unique style. Thank you to Harry for his support to the event. The orchestra kicked off our performance of Jesus Christ Superstar, followed by an eclectic mix of classical favourites and modern pop songs - many of which our MD Nigel has been working on recently, including several new pieces such as 'A Swingin Safari' by Bert Kaempfert and 'Aria' which was performed in tribute to the late Acker Bilk. The evening also saw the first performance of a Lady Gaga track by the orchestra! 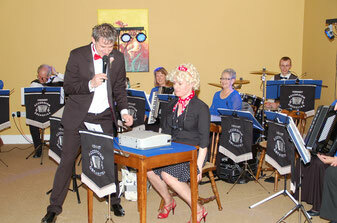 We were also treated to a performance from a special guest artist and aspiring secretary - Hilda Brown (AKA Helen Newton), who demonstrated her impeccable typing skills during a performance of "The Typewriter" by Leroy Anderson. Nigel joked she was being interviewed to keep his and the players music in order! During the evening a number of fantastic prizes, donated by members of the trust were offered to the lucky winners of a raffle. The generosity of all involved helped to raise an amazing £1,800 on the evening. Following the concert, a member of the audience has since offered to donate the circa £200 required to round the total up to £2000 - all in all a fantastic evening!